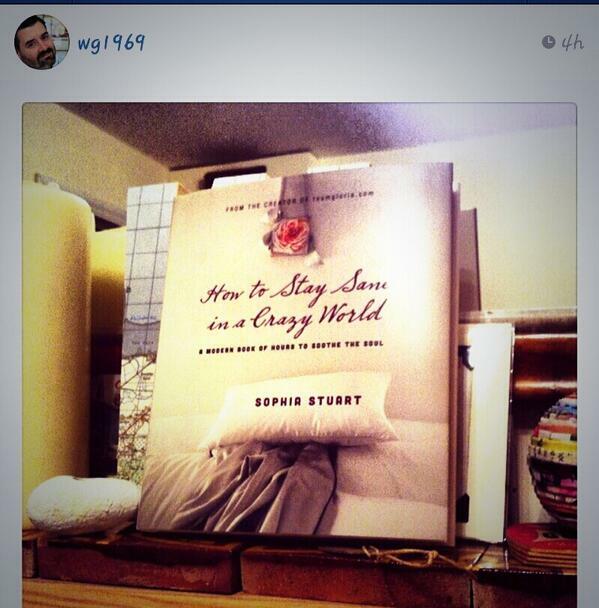 your book is a bonbon….and other delicious things people are saying about #howtostaysaneinacrazyworld – teamgloria, inc.
Posted on February 24, 2014 by teamgloria in people. look at what the lovely Ms Vickie Lester said about the book! and there was a 1st Sighting in Whitstable which was Very Exciting. we are hoping for a weekend sighting at the essex pleasure gardens on the newly laid patio and shall report back. AND there was an Electronic Sighting in BERLIN! Thanks ever so much to Ms. Beautycalypse for her kindness. can you see the original postcard on this Deeply Creative desk at the Atelier of the divinely talented photographer Mr. Martyn Thompson? and here are two quotes from other wonderful Readers (and we didn’t ask permission to quote from Private Emails so they’re remaining behind the large cloak and Venetian masks….unless they’re reading this and would Like to be Named, which would be utterly delicious). thank you ever so much for sharing the joy. Previous Post talk radio tales and other musings. This WOULD be a good book to read in the bathtub, as per one of the reader’s comments. I was in too much of a hurry, but can enjoy a second reading in my next bath. Also, would be good to bring along to the Spa! I must say, the book is so much in tune with the Movement that started a few years ago here and there, it’s beautiful in its wisdom and mission. and oh, all the gorgeous photos and snapshots of course. do you want to give us a quote that we can use on the book site itself? d i v i n e! The best thing to do with bonbons is to buy a box and share — I’ve already started! All as lovely as can be and admittedly making me a tad impatient! Good thing I just got an email from Amazon: the delivery date of your book for France has been moved up a whole month!!!! Whooohooo! A bonbon for the soul! Delightful! what do they call sweeties in NZ? not candy like in america, right?